"Roku TV has garnered high praise. People love how easy it is to access all their TV entertainment sources from one simple home screen, including access to the biggest streaming channel line up in the industry"
SARATOGA, Calif.--(BUSINESS WIRE)--Roku, Inc. today announced that it has added the Sharp brand to the Roku TV program. 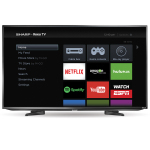 Sharp Roku TV™ models will soon be available for purchase exclusively at Best Buy stores as well as at BestBuy.com. Available in 43” and 50” screen sizes, Sharp Roku TV models represent a new generation of smart TVs that are built using the Roku TV reference design and feature the Roku® operating system (Roku OS). Roku TV offers one of the most simple, comprehensive smart TV experiences on the market. Roku TV provides access to the Roku Channel Store, which includes more than 2,000 streaming channels. Streaming channels available on the Roku platform feature movies and TV episodes plus live sports, music, news, fitness, and much more. In addition, consumers can use Roku Search to find availability and pricing for movies and TV shows across many top streaming channels. They can also search for actors and directors and view filmographies. Roku TV models feature Roku Feed, a new feature that lets consumers know when favorite entertainment becomes available to stream — and at what price. When browsing within Movies Coming Soon, consumers can “Follow” popular in-theater movies they are interested in and Roku will deliver automatic updates when relevant streaming information about the movie becomes available. Updates are provided when a movie is first released to streaming, becomes available from additional streaming channels or changes price. Both Sharp Roku TV models feature 1080p Full HD resolution and a 60hz native refresh rate. The 43” LED Sharp Roku TV will be available for $379.99 (MSRP). The 50” LED Sharp Roku TV will be available for $499.99 (MSRP). Both are available exclusively at Best Buy stores and BestBuy.com. Sharp Roku TV models will also be available at Best Buy stores in Canada and on BestBuy.ca. Visit BestBuy.ca for more information and pricing.